To see the page on Nevada firearms law, click here. This page concerns weapons other than firearms on the state level in Nevada. In Nevada, there is state-wide preemption of firearm, which includes weapons that may expel a projectile by expanding gasses. But the same is not true for weapons other than firearms. On the local level, regulations do exist limiting the possession of weapons other than firearms. Be aware also of federal law. There are a lot of federal lands in Nevada. Also, there are tribal lands within Nevada that have their own rules. Most of the weapon laws in Nevada can be found under Chapter 202 of the Nevada Revised Statutes. Nevada generally allows unlicensed open carry of most weapons. Permits for concealing weapons other than firearms can be issued by the county sheriff but unlike with firearm permits, the Sheriff is not required to approve such permits. Per NRS 202.350 it is generally unlawful to carry a concealed weapon. In addition to state law, beware also that local, tribal, and federal laws and regulations also apply within Nevada. Explosive or incendiary devices, dirks, daggers, switchblade knives, nunchaku, trefoil, blackjack, billy club, metal knuckles, any device used to mark any part of a person with paint or any other substance. Peace Officers, School Security, Written Permission from principal of school. Explosives, dangerous devices, and deadly weapons. Persons with "legal authority." NRS 393.410 applies to knives with blades over two inches long under the definition of "dangerous knife"
(a) “Dangerous knife” means a knife having a blade that is 2 inches or more in length when measured from the tip of the knife which is customarily sharpened to the unsharpened extension of the blade which forms the hinge connecting the blade to the handle. A sign on a private building stating that no weapons are allowed does not make weapons illegal there. If one is asked to leave however and does not then that person is trespassing per NRS 207.200. Archery Hunting NAC 503.144 Bans possession of a firearm while hunting under archery regulations. Foster Parenting NAC 424.600 "Any weapons, such as firearms, air rifles, bows, hunting knives or hunting sling shots, shall be unstrung and unloaded at all times when children are in the home. They shall be stored in locked containers or rooms out of the reach of children or made inoperable. Ammunition and arrows shall be stored in separate locked containers. Weapons shall not be transported in any vehicle in which children are riding unless the weapons are made inoperable and inaccessible." None. Per NRS 424.020 all licensed foster homes must adhere to the standards adopted by the Division of Child and Family Services. NRS 412.604 prohibits drilling or parading as a military company with arms in any town or city. NRS 203.080 prohibits associating together as a military company or organization with arms. Municipal Police, University or public school cadets or companies, militia of the State or troops of the United States may associate as a military company. The Nevada National Guard, and Troops of the United States can associate together as a military company or organiziation to drill or parade with arms. Members of Social and Benevolent Associations are not prohibited from wearing swords. Per NRS 202.350, it is generally illegal to carry a concealed weapon. For weapons other than firearms, the penalties for carrying a concealed weapon are shown below. Explosive substance other than ammunition or any components thereof. Any other dangerous or deadly weapon. What is a dirk or dagger? 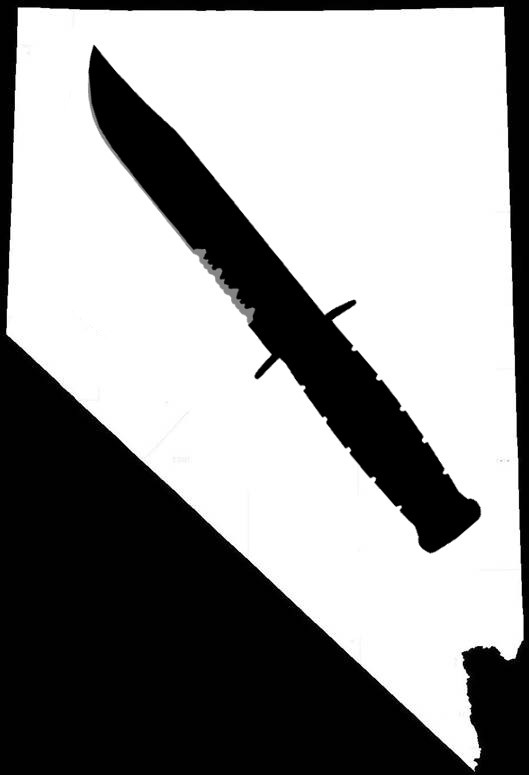 In Huebner v. State, the Supreme Court of Nevada stated, “a dagger is a short weapon used for thrusting and stabbing and that stabbing is using a pointed weapon to wound or kill.” In Knight v. State citing Bradvica v. State it is described that, "Relevant factors to consider" when determining whether a knife is a dirk or dagger include whether the knife has handguards and a blade that locks in place. It noted that a small pocket knife with a two and five sixteenths inch spring loaded blade with less than two inches along the sharpened edge was not a dirk or dagger. The steak knife was found not to be a dirk or a dagger because it did not have handguards to prevent the hand from slipping if used as a stabbing instrument, and because the court felt that the legislature would not have intended common household items to be considered a dirk or dagger. In Knight v. State the Supreme Court of Nevada states that in most cases a dirk appears to be type of dagger. What counts as an "other dangerous or deadly weapon?" This can only really be addressed by the courts. In an earlier version of the law, it was illegal to conceal a "dangerous knife," but the Supreme Court of Nevada found the law to be unconstitutionally vague. Despite "other dangerous or deadly weapon" appearing to be even vaguer, in Knight v. State, the Supreme Court of Nevada found that a steak knife was an "other dangerous or deadly weapon" under the law, and upheld a conviction under NRS 202.350 for a person who was concealing a steak knife. The court declared that in the case of an ordinary object like a steak knife, it became a weapon only when carried for the purpose of being a weapon. The appellant, Knight, had trespassed into an apartment and pursued a guest who fled the apartment to a store where he was arrested with a fork and a knife in his back pocket concealed by his shirt. One witness testified that she had been cut by his knife but battery charges were dropped. The attendant circumstances, including the time, place, and situation in which appellant was found in possession of the knife, unequivocally demonstrate that appellant was carrying the knife as a weapon. At the time of Knight v. State, carrying a concealed weapon of any type was misdemeanor. Later, the law was amended so that concealing a firearm, explosive substance, or "other dangerous or deadly weapon" was now a felony. Strangely therefore, the law now carries a lesser penalty for carrying concealed certain enumerated weapons than for carrying concealed non-enumerated weapons. Persons with a written permit issued by the county sheriff for the weapons listed on the permit. Peace officers, active and honorably retired after at least 10 years of service, generally do not need a permit to carry a concealed weapon. According to Attorney General Opinion AG 93-14, a weapon is concealed only if it is hidden on a person, (such as under a jacket,) or if it is in a container that is being carried by that person. For example, if a weapon is in a briefcase and the briefcase is in one’s hand, then that person is carrying a concealed weapon. But if that briefcase is on the floor nearby then that person is not carrying a concealed weapon. (a) “Concealed weapon” means a weapon described in this section that is carried upon a person in such a manner as not to be discernible by ordinary observation. Under NRS 202.350, the sheriff of any county may issue a permit to carry a concealed weapon other than a firearm, except for a switchblade knife. The sheriff can only issue a permit upon written application by a resident of his own county, showing the reason or purpose for which a concealed weapon is to be carried. The permit issued by the Sheriff is valid in all counties for the weapon described in the permit. There does not appear to be any existing application forms in any county for a concealed weapons application that does not pertain to firearms, but the law allows one to apply. The law does not require the sheriff to issue a permit. For weapons other than firearms, Nevada law does not recognize any out of state permits. Also, there is no way for an out of state resident to apply for a permit to carry a weapon other than a firearm. It is generally lawful to have a weapon in a vehicle, but all of the laws still apply regarding prohibited places, activities, and carrying a weapon concealed upon the person. What this means, is that you cannot, for example, have a prohibited weapon like a dagger in your vehicle when your vehicle is on the property of a school. Weapons can be openly carried upon a person, or placed elsewhere in the vehicle. There are no requirements for how they are transported. Weapons can be concealed anywhere in a vehicle (except on the person of someone without a permit to conceal), or displayed openly. It is not prohibited by law therefore, to have a weapon under, behind, or on top of the seat, or in a glove box, for instance. However, one still cannot hide a weapon on a person without that person having a permit. So without a permit, one cannot hide a weapon in their pocket or under a jacket they are wearing in a vehicle. This is because Nevada law only forbids carrying a concealed weapon upon a person. Due to the wording of this law specifying specifically metal knuckles, it would appear that the use of other materials would be lawful. Traditional brass knuckles, or ones made from other metals would be restricted, but not ones made from other materials such as plastics and ceramics. Peace officers of Nevada, active or honorably retired, as well as full time paid peace officers from other states and the federal government while performing official duties in Nevada are exempt. Also, persons summoned by peace officers are exempt. Members of the military when on duty are exempt too. Possession/Use of Nunchaku or Trefoil with Intent to Harm. Under NRS 202.350(c), it is illegal to possess or use a nunchaku or trefoil with intent to inflict harm upon another person. Below, these weapons are defined. A throwing star would qualify as a trefoil. (i) “Trefoil” means an instrument consisting of a metal plate having three or more radiating points with sharp edges, designed in the shape of a star, cross or other geometric figure and used as a weapon for throwing. Peace officers, active and retired, are exempt from prosecution under NRS 202.350. Nevada law restricts what it calls a "Switchblade knife," but it defines a switchblade knife to only apply to blades 2 or more inches long. It is unlawful to manufacture, import, keep, offer or expose for sale, give, lend, or possess such a knife, under NRS 202.350. Restrictions under state law that refer to "switchblade knives" do not apply if the blade is less than two inches long. Under NRS 202.355, the sheriff of a county may issue a permit to a person whose place of business is in his county, to manufacture, keep, or offer for sale switchblade knives if the person applying demonstrates good cause, the sheriff first holds a public hearing with the board of county commissioners concerning the issue of the permit, and the issued permit requires that the knives are only sold to a person outside of Nevada or to peace officers, on duty military personnel, and other distributors issued permits. NRS 202.357 regulates Electronic Stun Devices. (a) Emits an electrical charge or current that is transmitted by projectile, physical contact or other means; and (b) Is designed to disable a person or animal temporarily or permanently. Under NRS 202.357, it is prohibited to use an electronic stun device against on another person for any purpose other than self-defense. Felons without pardons restoring the right to bear arms. It is also unlawful for anyone to sell, give, or otherwise provide an electronic stun gun to another person with actual knowledge that the recipient would fit one of those categories. See NRS 202.260 through NRS 202.262. Also, see 202.750 through NRS 202.840. See NRS 202.441 through NRS 202.449. Click Here to see a summary of NV self-defense laws. Throwing Objects, Shooting Bows, Air Guns, Etc. Throwing any deadly missile in a public place or in any place where any person might be endangered thereby. Discharging an air gun or other weapon in a public place or in any place where any person might be endangered thereby. Use of fire arrows is limited! Per NRS 476.070 it is unlawful to discharge any projectile, bullet, or ammunition of a tracer or incendiary nature on any grass, brush, forest or crop-covered land. Per NRS 202.320, a person who in the presence of two or more persons draws or exhibits a dirk, dirk-knife, sword, sword cane, or other deadly weapon, in a rude, angry, or threatening manner not in necessary self-defense. This law also forbids unlawfully using such weapons in any manner in any fight or quarrel. This law exempts peace officers in the lawful discharge of their duties. NRS 202.585 prohibits malicious use of lasers against aircraft. Per NRS 202.255 it is unlawful for any person to set a trap, spring-gun, spring pistol, rifle or other deadly weapon except for government agents engaged in cooperative predatory animal and rodent control work under certain circumstances. Per NRS 202.550 lethal bait must not be placed on the public domain within 3 miles of any habitation, nor distributed by air without a written permit. And if it is placed, it must be marked by 4 foot steel or wood post with the upper 8 inches painted red and with a sign warning of the presence of the lethal bait. It is also illegal for a person to remove lethal bait left by another person. The procedures involved when a weapon is confiscated are covered under NRS 202.340. Under this law, when any weapon is confiscated by a person charged with an offense, the weapon must be surrendered to the head of the police force if it was found by a member of such a police force in an incorporated city, or by the chief administrator of a state law enforcement agency if the possession of the weapon was detected by a member of the agency. In the latter case, it must be disposed of pursuant to NRS 333.220 (which allows items worth over $1000 to be sold at public auction.) If neither of these situations existed, it must be surrendered to the sheriff of the county where the weapon was taken. Within one year, the confiscated weapon must be either retained for use by law enforcement, sold to another law enforcement agency, destroyed, traded to a licensed retailer or wholesaler in exchange for necessary equipment, or donated to a museum, the Nevada National Guard, or to another person furthering a charitable or public interest. The weapon can also be retained pursuant to court order or by directed by the district attorney or attorney general. If the weapon is not destroyed, and a person is acquitted of the offense he is charged with, the weapon is to be returned upon demand from the person it was confiscated from. Also, if it is determined stolen, the weapon must be returned to the owner. However, before any weapon can be returned, the director of the forensic laboratory shall determine whether it must be examined and whether it is a necessary addition to a referential collection maintained by the laboratory for purposes relating to law enforcement. Additionally, under NRS 179.121 all personal property including weapons can be confiscated when used in the commission or attempted commission of crimes of murder, robbery, kidnapping, burglary, invasion of the home, grand larceny or a felony related to terrorism.